The West Coast of South Africa is one of the most beautiful places on earth.With Endless space to roam. To escape. You can hit the open road and feel like you’re flying. We thoroughly enjoy our trips to the outlying regions. To the sleepy towns that lie along the rugged coast buzzing with fishing opportunities.Wind turbines power on undisturbed in the vast farmland as our friends over at the big industry plants cruise towards the lagoon connecting us to the rest of the world. This is why people come to visit, this is why we stay. And here at the heart of the west coast lies a town that we call our home - welcome to Vredenburg. 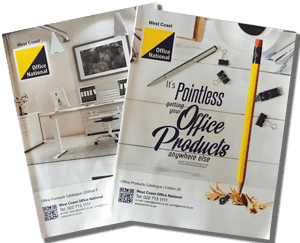 Please call our store on 022 713 1111 and request a full colour furniture catalogue and office supplies catalog or call in our store and collect a catalog.